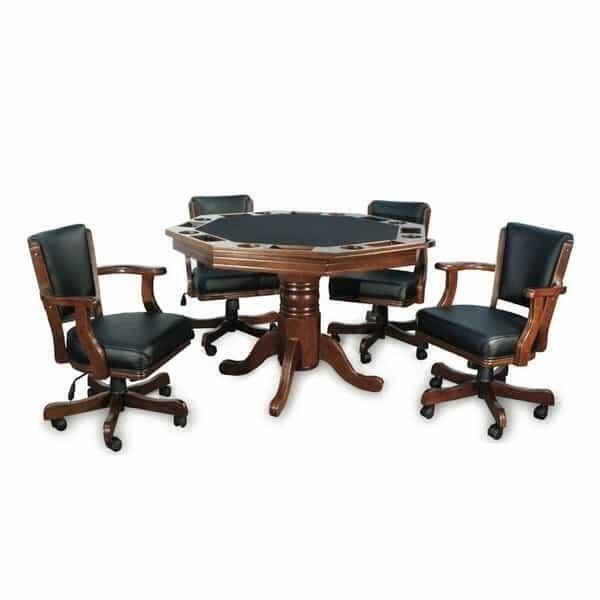 The Octagonal Two-In-One Poker Table by Presidential Billiards is one practical set of game room furniture. Sure, it’s made for a great game of poker; it has a felt playing field, drink holders and a place to keep your poker chips. It comes with 4 super comfortable swivel chairs so the game can go on for hours. But when the game is over, flip the top over and the Octagonal Two-In-One Poker Table becomes a beautiful and convenient dining table. The Octagonal Two-In-One Poker Table by Presidential Billiards is available in three fine finishes; cherry, walnut and espresso.